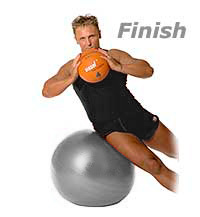 Lie on right side with TheraGear® Exercise ball under right hip and right side of rib cage. Cross feet so left foot is in front of right foot for balance, or anchor both feet against a wall. Holding a medicine ball in both hands at chest-height, lift right side of rib cage off ball. Keep hip on ball. Visualize bringing right side of ribcage toward right side of pelvis. Release. Repeat other side.